Some teachers and students tend to think that you can either sight-read or you can’t. But what if I was to tell you that sight-reading doesn’t exist? Instead, think of it as being part of a continuum that is called reading. At one end we begin with playing a piece that has never been seen before while at the other end we play pieces that have been rehearsed and refined many, many times. We know that sight-reading is a skill that is quite easy to improve as long as the approach is both systematic and consistent. Musicians who can learn a new piece quite fluently do so because they have thousands upon thousands of patterns – such as rhythm, pitch, tonality, meter – stored deep in the brain. These have developed over time through repeated and frequent exposure and use. This has allowed the students brain to wire up to recognize patterns automatically, with the minimum of cognitive input. When they see a new phrase, they can instantly decode the note patterns and know how it will feel in the body. What they can’t entirely read they will guess or simplify or improvise. How to improve on Sight-reading? People who learn music knows that good sight-reading requires the player to always scan ahead; to take in a new measure while still playing the current one. This “double vision,” like anything else, will improve over time with practice. And, of course, the more technique you have, the more difficult music you can handle. 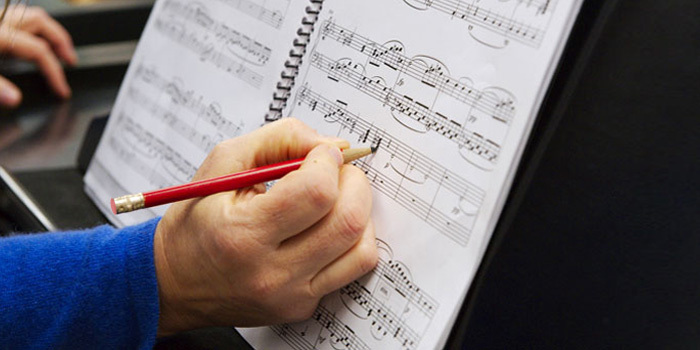 But sight-reading can be immediately improved with specialized work, whatever your level. In a nutshell, successful sight-reading requires three things at all times: (1) counting, (2) looking ahead, and (3) prioritizing. Counting and looking ahead are self-evident; it’s the prioritizing where things get interesting. Keep a steady pulse and maintain your place in the music (visually, if nothing else). Meter, tempo, and pulse are paramount. As Mozart once wrote to his father, “the most necessary, most difficult, and principal thing in music is time.” And your first responsibility is to your colleagues, who are depending on you to play in such a way as to allow them to get through their parts successfully. So, if you can do nothing else, play just the rhythmic skeleton, keep the basic time, follow your music along visually, and resume full playing as soon as you can without disruption. Whatever you do play must always fit within the pulse of the music. When a storm hits, the bar-lines are your friends; abandon all else and hold onto them! “Maintaining the pulse” is more subtle and difficult than simply counting. Indeed, if you count without listening you will harm the group. It means integrating others’ playing (which may well be inexact) into your counting. It requires intelligent and interactive listening to what’s going on around you and assimilation of that rhythmic activity into your internal pulse. Playing in “perfect time” to your own beat without regard to your partners will swiftly lead to a breakdown of the ensemble. Lastly, be sure you’re clear on “roadmap” issues in the music, such as repeat signs, 1st and 2nd endings, da capos, and fermatas. Roadmap mishaps will always lead to a halt in the proceedings but are easily avoidable with just a cursory scan. Play correct rhythms. If the pulse is solid, your next task is to render the rhythms precisely. The more complex the passage, the more important it is that the rhythm be accurate. A wrong (or dropped) note simply means the harmony sounds funny for a moment; it usually won’t affect anyone else’s playing. But a wrong rhythm can derail the entire ensemble even if the underlying pulse is steady. Tied notes. A common tendency (even in familiar music) is that the note following a tied-over note is often played too early. Dotted rhythms. The same tendency applies here; the note after the dot often comes too early. Try to feel the subdivision represented by the dot(s), and be sure that you arrive on the next beat on time. Syncopations. Syncopations are, in essence, a series of tied notes and, again, it is vital that you feel all the beats that are elided. Indeed, you must feel them extra strongly since you’re not playing them. Changing divisions. Watch out for “math” problems. Rhythms can often break down at junctures between triple and duple patterns. In complicated licks, make sure you can visually spot where each beat falls in the measure. Rests. This is no time to relax. Count them out as carefully as notes. If a rapid figure begins with a short rest (say, the first of four 16th notes), the note after the rest usually tends to be late. These issues will usually jump out at you as you scan through a part before playing it, and you should take a moment to sing or tap a tricky rhythm to yourself before starting. If you flip a page and a nasty lick comes at you completely on the fly, you should momentarily retrench back to Level I (play only what you can, while maintaining the pulse and your place). If the passage is very fast, this might require leaving out one or more notes, repeating a note as a “placeholder,” or perhaps just be playing an open string. What some call “faking” is a legitimate and even admirable application of the levels in their correct order, with the needs of the ensemble taking precedence over the “needs” of the individual player (who wants to hit all the notes). A run of steady eighth or 16th notes becomes much harder in an asymmetrical bowing pattern (3+1, two-slurred/two-separate, etc.). But since the Prime Directive is to never lose time, if you need to simplify a bowing pattern to stay on track, don’t hesitate. Accomplishing Level II requires above all the complete understanding (and practice) of the dictum that correct rhythms take precedence over everything except the basic pulse. The notes (finally!). If the passage is one for which the first two levels are not problematic, then you can focus on the pitches. In your initial glance, obviously, look at the key signature, but try also to determine the mode (e.g., D major or B minor). Think through (or even quickly mime) both scale and arpeggio fingerings for that key, especially if it’s one you’re not generally conversant with. Developing one’s abilities on this level involves an unconscious process of storing and recognizing more and more patterns. Over time, you will develop a “database” of common melodic and accompaniment figures, which you will begin to match to the music in front of you. There is a syntax for the music of each style period, and when you come upon a familiar pattern, you shouldn’t need to read every note. Instead, with practice, you will gradually learn to process notes in clumps rather than one at a time. Our new sight-reading app helps pupils develop the skills they need to quickly spot key features, patterns, and characteristics in music. Based on a series of fun games and 155 new pieces of music, Sight-Reading Trainer is a great way to improve reading skills and prepare for Piano exams at Grades 1 to 5. Instrumental teachers have the job to ensure that these thousands of patterns are taught systematically and consistently. Almost everyone has the ability to learn to read notation musically to a greater or lesser extent, and yes, I do mean just about everyone. We wouldn’t dream of saying that only a selected, talented few children are capable of learning to read and write words. Some get there quicker than others whilst others need a bit more help but the expectation is that they will all develop some reading competency. By plunging straight into reading we miss out the first three skills which completely ignores the sequential order of development. The consequence of this is that many pupils struggle to fully grasp the meaning of notation – in the end many give up! How do you teach notation? Many tutor books focus on teaching notation – yet isn’t it strange that so many pupils really struggle with sight-reading? There has to be a mismatch going on somewhere. Maybe this isn’t about sight-reading at all but actually about how pupils learn to read notation? Do you teach pitch notation in shapes and patterns or as isolated pitches, maybe using mnemonics? Are pupils able to clap/play/count rhythm phrases independently and accurately? Do pupils have enough kinaesthetic sense to be able to make up or improvise something they can’t quite read fast enough? Are you persistent and consistent in your approach? Do you keep revising the basic material for long enough? Is notation reading always approached as a serious task or do you play games to help reinforce the many concepts? As ‘expert’ readers we have forgotten just how long and complex the task of learning to read notation musically is. If you focus on teaching rhythmic and pitch patterns in a playful and consistent way, so that the pupil can respond to them automatically, you will find that their reading and consequently their ‘sight-reading’ will improve beyond recognition.